One of the most common questions about power kiting is what is the difference between the different types of power kites. 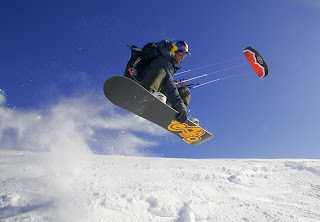 Snow and water kiting uses kites that are quite large in size while kite buggying will use a kite nearly half or even smaller in size. So I have put together a basic blog on the differences between the different types of power kites. This was an anser to a post on one of the online kite forums. Hopefully it will help clarify these differences and help educate anyone else who may have the same question. What the heck is a fixed bridle and why would you depower a power kite? For a little bit more clarification.....and because you are most likely a beginner (which is very welcome on here) and also because there are tons of lurkers on here who have not yet asked the excellent questions that you are asking, I will go into a bit more detail on this one. First lets explain what a Bridle is. The "bridle" of a kite is the line or network of lines that run from the sail of the kite or skin to the point where you attach your flying lines to. This can be a very complex network of lines that "V" off into several other lines which eventually attach to the kite....OR, it can be a very simple one or two lines that runs from the edge of the kite to your flying lines. Basically any line or lines that are permanently attached to the kite that you hook up your flying lines (or control lines) to is considered a bridle. There are many different types of bridles on the planet, for this purpose we will only be discussing the two most common bridles used in power kites which generalizes the kites into two classifications. This would be the "Fixed Bridle" and the "Depowerable". A "Fixed Brid le" is basically what it says. The bridle is "Fixed" or permanently attached to the kite and is set up in such a way that it should not ever be changed. In most cases it is not recommended to change or adjust a Fixed Bridle. A Fixed Bridle is usually set up from the factory to give the optimum performance of a sail shape. By altering the bridle you will alter the shape of the sail which will usually negatively affect the performance and/or stability of the kite. To put it in simple terms, a "Fixed Bridle" kite is one that the bridle of the kite is permanent and the physical length and settings of the bridle cannot be changed during flight. With multiple bridles (dual or quad), you have the ability to change the angle of attack of the overall kite wing, but the actual shape of the bridle and sail is in a fixed position. The other type of bridle setup that is discussed is a "Depowerable" bridle (also referred to as a "Depowerable Kite"). The easiest way to classify this type of bridle is an "Active Bridle System" that can be changed on demand from the pilot during flight. This type of bridle starts out similar to the "Fixed Bridle" in that the majority of bridle lines are still attached directly to the sail, but this type of bridle will usually be quite a bit more complex and usually incorporates additional pieces such as guide lines and pulley's to make the bridle active and adjustable during flight. With this type of bridle, the pilot will have the ability to change the physical shape/curvature of the sail as well as change the overall angle of attack during flight and pretty much "on demand". The most common setup would be with using a free floating control bar that can be pushed/pulled to change the curvature of the kite (through the active bridle) while you fly. The basic operation is that when you pull the bar towards you, you don't change the angle of attack of the sail but instead pull in the trailing edge of the kite (bottom) as well as the middle of the kite while the leading edge stays constant - basic terms, your changing the actual curvature of the sail while the kite is flying in the air. This is done at a ratio that will allow the kite to increase or decrease power while still maintaining stability and control. Think of it as having a large bed sheet and holding it in the wind. If you hold onto the very top of the sheet and let the rest of it hang loose, the bottom of the sheet will be picked up by the wind and it will just flap away in the wind with very little power. Now have someone else grab onto the bottom of the sheet and start to walk back towards you, pulling the sheet so it catches the wind. The Sheet will billow up and start to produce power. This would be similar to what is being done on a depowerable kite while you pull the bar towards you. You are "cupping" the kite in the wind to create more power. When you let the bar out, you spill the wind off the sail and the kite becomes "Depowered". Because of the overall design of depowerable kites, they generally produce less power per size than a fixed bridled kite. Remember that the curvature of a fixed bridled kite is set at maximum power all the time. A Depowerable kite needs to be adjusted by the pilot to find the optimum power setting for the current winds. Also, because a depowerable kite needs to be able to stay flying and maintain stability when not set at the optimum setting, extra design and material must be used to keep the kite inflated and flying at settings that are far from optimum (when the kite is depowered). This comes at a cost of overall performance. Because of this factor, depowerable kites are usually quite a bit larger in size than fixed bridle kites to produce the same power, Depowerable kites are usually slower and not as agile as Fixed Bridle kites because of their larger sizes and increased mass in the air. To put it in a nutshell and in simplest form. Fixed bridle kites have the bridles that are in one "Fixed" position and (in most cases) should not be changed. Depowerable kites have an active bridle that can be altered on demand from the pilot during flight. Fixed bridle kites will produce a lot more power per size and be more efficient. Depowerable kites will produce less power per size but will have more wind range that they can be flown in because they can dump the wind and power as it increases. I hope this helps everyone understand the differences between fixed bridled kites and depowerable kites a little better. So, I have been having a little trouble getting my wonderful Wife out on the flying field with me to enjoy this awesome sport of kite flying (ok, I am obsessed). It’s not really her fault though, most of the difficulty comes from our young ones that not only demand constant attention but love to get into everything they shouldn’t and/or disappear the second you turn your head. But chasing the kids all over the park isn’t the whole problem, I honestly feel that some of the problem is today’s kites. Today’s kites are not bad, in fact they are pretty darn awesome compared to the kites of yester-year. Not only are they now designed using ultra high tech computers with 3D cad programs but they are built with space age carbon fiber & graphite, and lightweight high tech poly molecular sail materials such as Icarex and ripstop nylon....all for prices that are a fraction of what you use to have to spend to buy a professional competition quality stunt kite from the “Old School” days. But I feel the problem that we (the kite flyers) and the industry have created is that today’s kites are designed to compete against each other on which one can roll up the easiest or which kite can do the latest comete or multi lazy susan’s or jacob’s ladders. If a kite of today isn’t capable of doing all of the latest high end tricks (that most pilots have trouble doing anyways) then it is “black flagged” or said to be not a good purchase. This type of new school trick flying usually means the kite needs to be able to pitch (flip) onto its back in a moments notice and/or that the kite spins (rotates) quick with the simplest of tugs. All flight characteristics that a new pilot just learning to fly can get very frustrated with as it usually ends up with the kite flipping out of control, line snags or tangles from excessive spins and/or lawn darting into the ground unexpectedly. So, I had the chance to fly a friends Top Of The Line, North Shore Radical (NSR) a while back while it was on loan to another friend to take some pictures of it. This is a custom colored NSR that had been re-framed in specially wrapped Revolution Carbon Rods (extra strong). Surprisingly, this kite had very little if any air time on it at all and was in fantastic condition....for being nearly 15 some-odd years old. The NSR was a monster of a kite when it was first introduced. It was designed for competition and had a very aggressive sail design that produced quite an impressive amount of pull when the sail got loaded up. Another fun characteristic of this kite was that it produces a very low, Harley type thunder sound as it flies through the window. Old school kites all have one thing in common - they are FUN TO FLY!!! With some aggressive flying you could snap off perfectly sharp 90 degree turns and loud thundering figure 8's - this kite loved to be flown aggressivly. The flight characteristics are a somewhat slow, smooth and very solid feel through the lines, super stable, not “pitchy” at all, in fact this particular kite is rather difficult to trick with and is about impossible to do any of today’s new school tricks on. It can axle (with some work) and side slide, snap stalls are solid and perfectly square....but that’s about it folks! LOL. 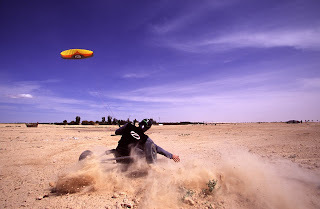 There was a bunch of us at the flying field all taking (very long) turns putting the NSR through its paces. Everyone who had a turn on it had a huge smile on their face and didn’t want to put the kite down. Another thing I noticed was that as the NSR flew, a large crowd of “non” kite flyers gathered or stopped and stared as the kite thundered through the air. Now we fly at this park every Friday night and tonight was no different but we have never had a crowd of people watching any of the kites fly like they were during the NSR flight time. The noise was attracting them, as was the leaning back on the lines as the pilot controlled the power of the kite while it flew...it was FUN to fly...and not only was it fun to fly but it LOOKED like a lot of fun as well! No work, no complicated routines, no resetting the kite after a failed trick...just solid power, thundering noise and kite flying fun! I was somewhat perplexed. Here there were over $2,000.00 dollars worth of high end stunt kites laying on the ground including a Quantum Pro, Widow Maker Custom, Deep Space, Mojo, Zephyr and one or two other high end stunt kites as well as some larger foil power kites....and everyone (including myself) was waiting to take a trip down the old school lane and fly this really cool NSR. It was an awesome night. Now to bring this blog back on track, I ended up making a deal with my fellow flying buddy and purchased this NSR from him because I felt that it would be the perfect kite to help get my beautiful Wife out flying more with me....and I was right. After some work of luck, we ended up on a school playground with a grassy field next to the play area for the kids. The wind was perfect for the most part but a little light at times. I set the kite up, ran out the lines and with some hesitation by my wife, I ended up taking the maiden flight (not that I minded at all, in fact I was wanting to fly the kite the minute I got it out of the truck). The kite went up without a hitch and what made it even more awesome is that the school buildings off to the far right were shaped in such a way that the thundering sound of the NSR echoed through the empty playground which really enhanced the experience. My Wife had a huge grin on her face from the nose and with a chuckle said “That’s a pretty cool kite!”. After a couple passes, I landed the kite and (reluctantly) handed the handles over to my Wife who was apprehensive to say the least. “I don’t want to break it.....Maybe you should just fly...etc...etc... With some reassurance (persistence?) she finally took the handles and put the kite in the air. At first the wind was at a low and we got a tangle. I quickly straightened out the kite and got it reset as the wind picked back up. Another good launch and the kite shot to the air and she started to pass the kite back and forth high in the sky. The kite thundered softly as it moved back and forth and it wasn’t long before my Wife was rocking it through the center of the window, enjoying the pull, control and the echoing thunder of the kite. The grin on her face was enough to tell me that this was a good choice. We spent a good hour or so flying and had a wonderful time together - with her using up the majority of the flying time (which was perfect and right in line with my evil plans - LOL). When asked, she said that she would love to fly again soon, which made me very happy to hear. So I began to ponder over the last couple weeks and this super fun NSR. Has the kite industry been obsessed with a self destructing desire to only produce the best kite ever that practically tricks by itself - and has this desire to do the latest and greatest tricks somewhat shoved the “fun” factor off to the side? For the experienced pilot maybe not so much, but for a new pilot looking to just have some simple no-stress fun flying a kite....I think so. I wonder if the manufactures of today could (or would be daring enough) to make a basic “fun” kite similar to the flight characteristics of the NSR and be successful (profitable) with it. With the cost of building product overseas and today’s designing techniques, I can’t see how it would be over expensive or much of a risk. I strongly feel that we need a kite like this to help get more people involved in this awesome activity. We have some very awesome high end trick kites that can do pretty much any trick you can think of....but we don’t really have any kites available today that are just simple to control, easy to learn and down right fun to fly. New Tech tried to tackle this hurdle with the BLK - which stood for “Big Loud Kite” - it was a disappointment to say the least....but (I feel) not because of the public but because they chose to build the kite out of such poor materials (IMHO). The frame was a very thin flexible fiberglass frame which flexed and bowed under marginal winds. To compensate they added in a fourth leg of the bridle...which was at the wrong length and totally worthless out of the bag and the shop (or customer) had to manually re-tie and cut the bridle leg to length so it would work. The bridle itself was heavy and out of adjustment. Even after fixing all those things (on a brand new kite out of the bag) the kite still flew rather poorly and only started to make any noise at all when the winds were over 12 mph. Very disappointing to the customer and sales were rather disappointing to the shops. The kite was eventually discontinued. 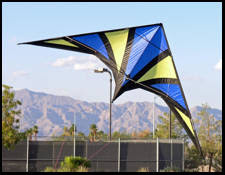 I was depressed with the poor design and flaws of the BLK and still feel strongly that if a kite was produced today that centered around “fun” instead of tricks that it would be a huge success. Just make sure that it is built with today’s quality and materials, fly’s correctly out of the bag, can fly in lighter winds (4-5 mph and up), and retains that “Old School” style, noise and arm-tugging feel. Now I seriously doubt that I would ever give up my high end kites and only settle with the NSR to fly but neither would I toss the NSR to the side and never fly it again. There are some days when the old school kites such as the spin off, Hawaiian, Trick Tails, the NSR (and many others) are exactly what I want to fly, to forget about the stress of the work week, traffic, and other daily problems, or to take a needed break from mastering or learning a new trick ---- just have an exciting time flying that is nothing but pure enjoyable FUN!